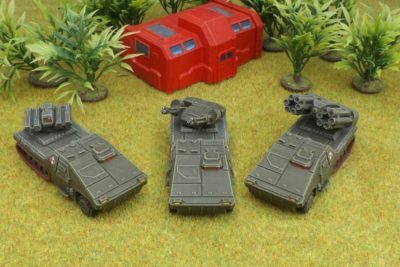 New out of the Brigade Models factory are a trio of support half-tracks for their 15mm Polish forces. The Wilk (Wolf) chassis carries either a pair of tri-barrel AA gatlings, a quad anti-tank missile system or a 12-barreled multiple rocket artillery system. The Wilk is derived from the Suwalska half-track family, but with a flat-bed rear replacing the former’s passenger compartment. The turrets are of Soviet origin, bought in and retro-fitted with indigenous electronics and sensors.